Disney Research guides two degree-of-freedom open chains using the coupler curve of a geared five-bar linkage to obtain geared seven-bar and nine-bar linkages, which they use to move the front and rear legs of their Cyber Tiger. By connecting the driving gears of the four legs, they obtain a one degree-of-freedom system that animates the Cyber Tiger. The computational design system uses an optimization routine to adjust the coupler curve of the five-bar linkage to approximate a given curve in order to guide the system in a desired movement. The results are terrific, and look a lot like the mechanical toys of the past. Select this link for more information. 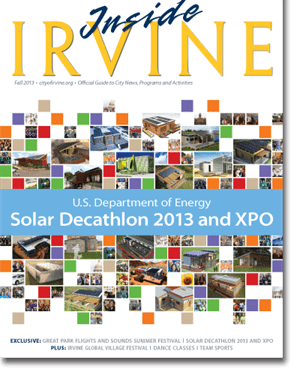 Inside Irvine has an article about the 2013 Solar Decathlon and XPO at the Orange County Great Park. Select this link to access the on-line magazine. See page 5 for descriptions of each of the 20 Universities competing in this event. The UCI summer program Introduction to Racecar Engineering concluded with a track day on Saturday, August 3. Select this link to see slideshows of the activities. Our paper Numerical Synthesis of Six-bar Linkages for Mechanical Computation provides the mathematical theory that underlies the synthesis of a six-bar linkage with an input-output relationship that approximates a specified function. This describes how the Stephenson III six-bar linkage that sets the elevation for a ballistic trajectory was designed.